NF-κB (Nuclear factor kappa-light-chain-enhancer of activated B cells) is a protein complex that controls transcription of DNA. NF-κB is found in almost all animal cell types and is involved in cellular responses to stimuli such as stress, cytokines, free radicals, ultraviolet irradiation, oxidized LDL, and bacterial or viral antigens. NF-κB plays a key role in regulating the immune response to infection. Incorrect regulation of NF-κB has been linked to cancer, inflammatory, and autoimmune diseases, septic shock, viral infection, and improper immune development. NF-κB has also been implicated in processes of synaptic plasticity and memory. There are five proteins in the mammalian NF-κB family: NF-κB1, NF-κB2, RelA, RelB, c-Rel. NF-κB transcription factors are critical regulators of immunity, stress responses, apoptosis and differentiation. In mammals, there are five members of the transcription factor NF-κB family: RELA (p65), RELB and c-REL, and the precursor proteins NF-κB1 (p105) and NF-κB2 (p100), which are processed into p50 and p52, respectively. NF-κB transcription factors bind as dimers to κB sites in promoters and enhancers of a variety of genes and induce or repress transcription. NF-κB activation occurs via two major signaling pathways: the canonical and the non-canonical NF-κB signaling pathways. 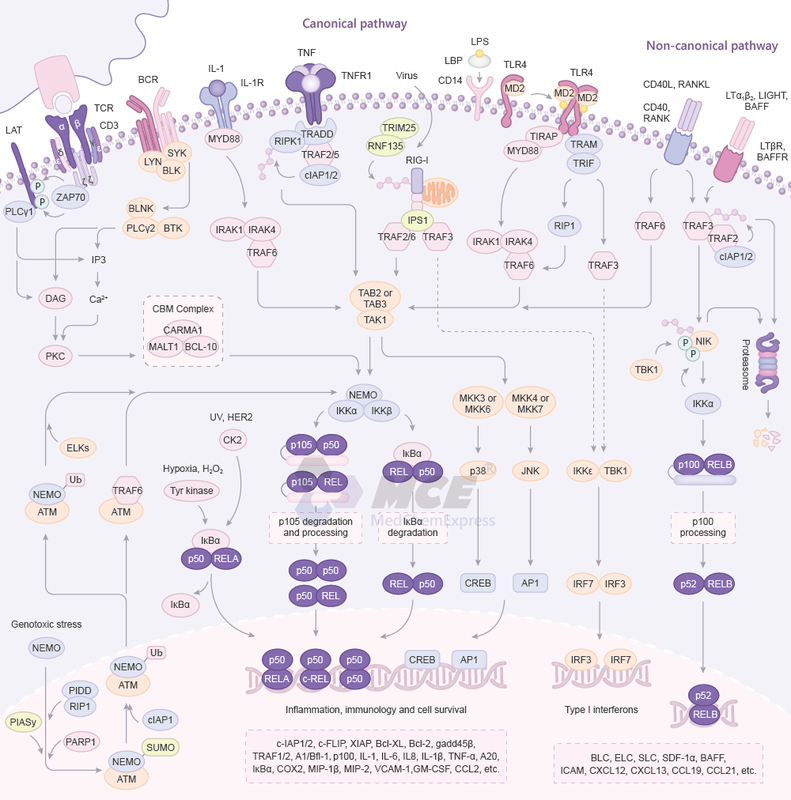 The canonical NF-κB pathway is triggered by signals from a large variety of immune receptors, such as TNFR, TLR, and IL-1R, which activate TAK1. TAK1 then activates IκB kinase (IKK) complex, composed of catalytic (IKKα and IKKβ) and regulatory (NEMO) subunits, via phosphorylation of IKKβ. Upon stimulation, the IKK complex, largely through IKKβ, phosphorylates members of the inhibitor of κB (IκB) family, such as IκBα and the IκB-like molecule p105, which sequester NF-κB members in the cytoplasm. IκBα associates with dimers of p50 and members of the REL family (RELA or c-REL), whereas p105 associates with p50 or REL (RELA or c-REL). Upon phosphorylation by IKK, IκBα and p105 are degradated in the proteasome, resulting in the nuclear translocation of canonical NF-κB family members, which bind to specific DNA elements, in the form of various dimeric complexes, including RELA-p50, c-REL-p50, and p50-p50. Atypical, IKK-independent pathways of NF-κB induction also provide mechanisms to integrate parallel signaling pathways to increase NF-κB activity, such as hypoxia, UV and genotoxic stress. The non-canonical NF-κB pathway is induced by certain TNF superfamily members, such as CD40L, BAFF and lymphotoxin-β (LT-β), which stimulates the recruitment of TRAF2, TRAF3, cIAP1/2 to the receptor complex. Activated cIAP mediates K48 ubiquitylation and proteasomal degradation of TRAF3, resulting in stabilization and accumulation of the NFκB-inducing kinase (NIK). NIK phosphorylates and activates IKKα, which in turn phosphorylates p100, triggering p100 processing, and leading to the generation of p52 and the nuclear translocation of p52 and RELB.
. Oeckinghaus A, et al. The NF-kappaB family of transcription factors and its regulation.Cold Spring Harb Perspect Biol. 2009 Oct;1(4):a000034.
. Taniguchi K, et al. NF-κB, inflammation, immunity and cancer: coming of age. Nat Rev Immunol. 2018 May;18(5):309-324.
. Perkins ND,et al. Integrating cell-signalling pathways with NF-kappaB and IKK function. Nat Rev Mol Cell Biol. 2007 Jan;8(1):49-62.